Spacing is one of the most unique magazines to appear on Canadian newsstands in years. The magazine uncovers the joys, obstacles and politics of Canada’s big cities by cutting through the cynicism that often pervades any discussion about urban issues. Spacing pushes readers to think critically about how they can shape the public spaces that surround their everyday lives. 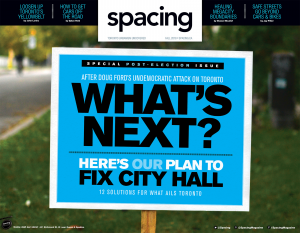 Spacing was launched in the fall of 2003 by a group of young journalists and public space advocates who felt that Toronto needed a publication that would bring together a number of key urban issues that were not being discussed by the local media. Topics like public transit, urban design, public art, community planning, and sustainable development were brought together under one umbrella to create a forum for residents and the urban curious to discuss these pressing topics. Spacing is published four times a year and can be bought on newsstands or delivered directly to your home. Two Toronto-centric issues and two nationally-focused editions are published each year. The magazine has been named Canadian Small Magazine of the Year in 2007, 2008, and 2009. In 2011 and 2012, Spacing was named Best Magazine Blog and Best Magazine Web Site by the Canadian Society of Magazine Editors. In 2010, the editors received the prestigious Jane Jacobs Award from the Maytree Foundation and Ideas That Matter. Contact Spacing: please note new address as of Oct. 1 2014! Send all subscription orders, cheques, books, and products to the above address. If you have a specific concern please visit our customer service centre.